Five artists celebrate nature’s mystifying language by examining human relationships with the earth in a new exhibition opening at the Alice Gallery. 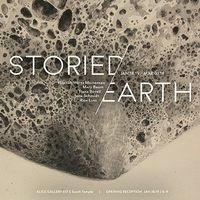 Storied Earth features artwork by Hannah Wertz Mortensen, Mary Baum, Tiana Birrell, Jena Schmidt, and Ron Linn. Storied Earth, opens January 18 and runs through March 1, with an artist reception January 18 from 6 – 9pm during Salt Lake Gallery Stroll. The exhibition is presented by The Utah Division of Arts & Museums at the Alice Gallery, located at the historic Glendinning Mansion at 617 East South Temple in Salt Lake City, which is free and open to the public Tuesday through Friday 10am to 4pm The artists met seven years ago while working in the BFA Studios at Brigham Young University. They found themselves continually looking out of the large north windows of the studios at Mount Timpanogos - white and inscrutable on the horizon. As they each developed their individual research, a shared sense of connection to the land began to creep into the work, the Utah landscape worming its way in between line and form. Years on, and the artists are still haunted by and drawn to the land in ways that they struggle to express in words. Language shapes landscapes, both internal and external, political and private, magical and mundane, metaphoric and literal. To name something is to know it intimately, but how are we to name that which we don’t have the vocabulary for, or for which our words are inadequate? How might we come to read messages written in the stones and the water like we would from a book? And what of the particular language of ownership, that marks the edge of what we call wild? Caught in the intersection of language and landscape, words – whatever form they might take – attempt to record, reconstruct, and organize the human/earth relationship on both a personal and public scale. The work in this show represents a communal lexicon of images, objects, and texts which attempt to re-wild the word-shed, to locate the boundary between language and the earth, or perhaps to find a new language to even speak about it.